We are so excited to partner with Creativebug to showcase designers in their new Fabric Design Series. Creativebug is the go-to source for online art and craft instruction. Their new Fabric Design Series is a 5-week course featuring creative rock stars Denyse Schmidt, Heather Ross, and Lizzy House. Each artist shares her own design process–from inspiration to creating repeating designs, working with color and much more. 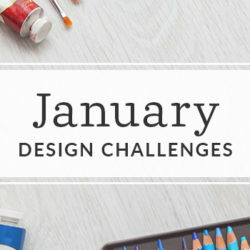 In this challenge, folks who have recently enrolled in the new course have the opportunity to show off their new designs for a chance to win incredible prizes to take their designing to the next level! 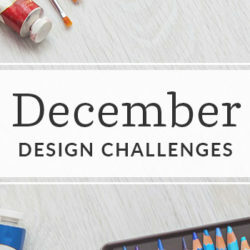 All of the top-ten designers will take home great prizes in this challenge! 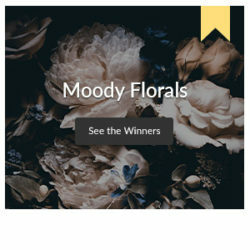 The top three popularly-voted designers will be matched with either Denyse, Heather, or Lizzy to receive a review of their winning design, plus they’ll take home a 12-month subscription to Creativebug, $100 in Spoondollar credit, a 12-month subscription to Adobe Creative Cloud! Folks voted into slots 4-6 will receive a Wacom Tablet, Moleskine Evernote Sketchbook, and a 6-month subscription to Creativebug! The rest of the top ten will take home a Christine Schmidt Carve-A-Stamp Kit, drawing pads, and Micron pens! Sign up for the Creativebug Fabric Design Series today, and start planning your Design Challenge entry! WHO: Spoonflower and Creativebug are teaming up for a very special fabric design challenge. 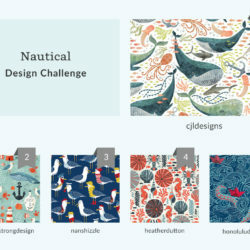 WHAT: Our Creativebug Design Challenge showcases the work of folks enrolled in the new Creativebug Fabric Design Series. WHEN: The design deadline is April 14, 2015. Voting will take place April 16-22, 2015. The winner chosen from the popularly voted top ten designs will be announced on April 23, 2015. HOW: To enter, participants enrolled in the Creativebug Fabric Design Series should create your own Spoonflower account, upload an original fabric design to the account, and enter the design in the Creativebug Design Challenge contest using the drop-down menu for entering contests. 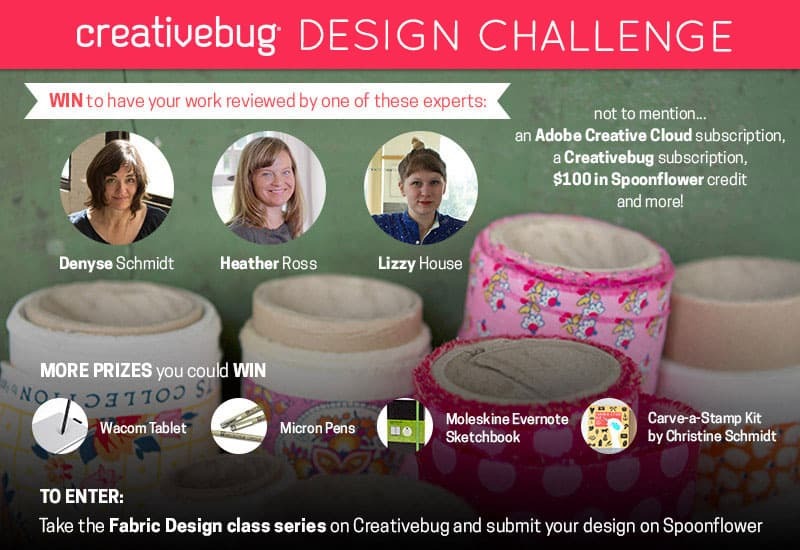 To enter this Design Challenge, you must be registered for Creativebug’s Fabric Design Series. Designs should be created especially for this contest, and all artwork must be your original work. Your Spoonflower preview will be viewed at 150 dpi in a fat-quarter size (21” x 18”). See full details and official rules here. So, I signed up for the free trial, entered my Spoonflower code, and selected the class. Is that all I need to do to be “registered”? Yes, Amelia! You are good to go! « DIY Giant Wallpaper Stickers!